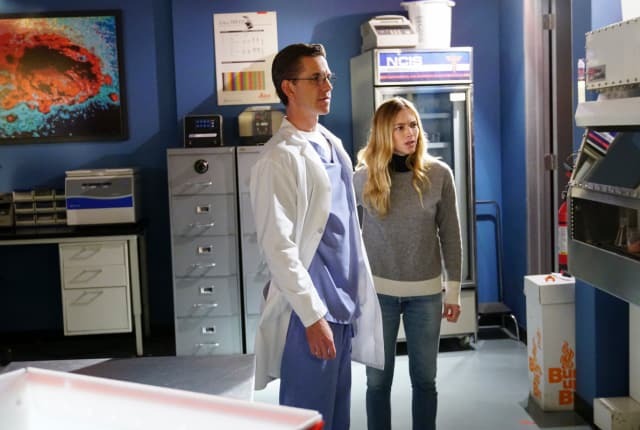 On NCIS Season 15 Episode 18, the NCIS headquarters are evacuated when the team finds a body as well as bomb materials on the roof of the squad room. When you watch NCIS Season 15 Episode 18 online, a slow day for the Major Case Response Team takes a turn for the crazy when an explosion goes off on the roof of NCIS Headquarters, fatally injuring an air conditioning repairman who was working up there. Much to their confusion, they soon discover that the repairman was an imposter. Not only that, his toolbox contained a defective bomb, which was what actually killed him. Thinking it better to be safe than sorry, they decide to evacuate the building and let the bomb squad do a sweep to see if any more explosives can be located. After most everyone is out of the building, however, a lockdown ensues, trapping various members of the team througout the headquarters. It soon becomes very obvious that there is far more to this situation than meets the eye, and they are all in danger from whoever it is that triggered the lockdown protocols. Who are they? What do they want? And why have they infiltrated NCIS? There are many questions for the scattered team to answer, and without communication with each other or the outside -- which doesn't even know anything's gone wrong. Find out what happens when you watch NCIS Season 15 Episode 18 online!